This is one of my favorite photographs of Dean. I took it during our visit to Italy in 2008, three years after Kevin’s death. Honoree had dreamed of a family visit to Italy for years, and we finally made it–but not in time for our younger son to enjoy the splendors of the country with us. Dean was 27 then, still devastated by the loss of his brother–perhaps more than we realized–but still resilient, even as the “prodromal” phase of his own affliction with schizophrenia was advancing. I made this photo through the window of a cafe beside a harbor on Capri, where Honoree and I were having a light lunch. Dean, who was still capable of joy and discovery, had decided to take his notebook and pen outside, where he positioned himself on the rocks by the water, in the sunshine, and channeled his inspiration into his journal. Dean was then two years from his own psychotic break, triggered by romantic loss, but really the inevitable result of several years of accumulating stress, including his beloved brother’s suicide. As of today, Dean is still fighting gallantly to regain the equilibrium he maintained on that sunlit vacation. He lives in the warm embrace of our household in Vermont. My account of his saga–described in NO ONE CARES ABOUT CRAZY PEOPLE–is a testament to all the unknown battles being waged by victims of this horrible scourge who still can muster the mental resources, and the deep wells of character, to carry on their daily struggle for a meaningful life. 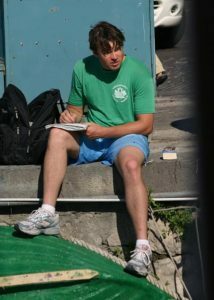 I never glanced into the journal entries that Dean created in the exhilaration of that sunlit day on Capri. He didn’t volunteer to show us what he’d written, and Honoree and I respected his boundaries, and did not ask. But I know that the words Dean set down are irradiated with his loving ardency and eloquence. Maybe someday I will look.